In this modern day and age, we often forget there is more on this planet than just your home. As a young student with a love for maps, I have always set my eyes on this little corner of the world, an untouched paradise: Osa Peninsula. As I mentioned, I absolutely love maps. I have laid my eyeballs over thousands of them, hungry for locations and searching for something new. However, maps can only tell you so much, and in reality they are portals to the lands they project. For Christmas, Santa delivered me a beautiful atlas, however, this atlas was a very recent edition. Thanks to the work of scientists in the field, preserving the ecosystem has never been more highlighted in history and this new atlas revealed every single National Park in the world. While browsing the atlas, Costa Rica really stood out. National Parks practically litered the page, and the Osa Peninsula was drowned in a sea of green labels. One minute I found myself staring at a page in a book and in the next I found myself in a plane leaving Los Angeles. Life can be hilarious sometimes. 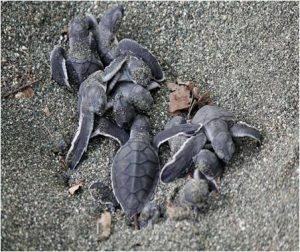 Once at Osa Conservation, we participated in hatchery checks where we released hundreds of sea turtle babies. Everyday, I watched them crawl into the ocean with a smile on my face. Once the turtles made it home, we would trek back to the camp through a beautiful rainforest, and we could see tons of different animals that Osa provides with its limitless biodiversity. The forest is never quiet and is always so full with life and magnificent greenery. Butterflys float around the fields and birds soar across the blue sky with grace. Monkeys of all types leap across the forest canopy whilst snakes slither across the forest floor. In the rivers and swamps you can find basoliths, lizards capable of walking on water, and small schools of fish swimming through the clear water. In California, almost none of the animals found here exist; the two enviroments are polar-opposites. If there is something I will never forget about Osa, it must be the local fauna and plantlife. While living at the Osa Verde BioStation was at first out of my comfort zone, it quickly became a lovely and comfortable second home. The first day, I found a large spider sitting on a counter the size of my hand, that certainly give me a heart attack! However, each night the sky is covered with stars, a view I never saw in the USA. When staring at the stars, you will always hear monkeys, insects and birds, a non-stop noise but not an annoying one. It gives the surrouding forest livelihood and soul, showing you just how active Osa is. Once in bed I fell asleep, the living quarters were extremely clean, something you definently wouldn´t expect. In fact, I have never slept better in my life; I was sound asleep like a baby. Three times a day meals were served, and all of them were delightful. All things considered, the food served here is best I´ve had in a long time. 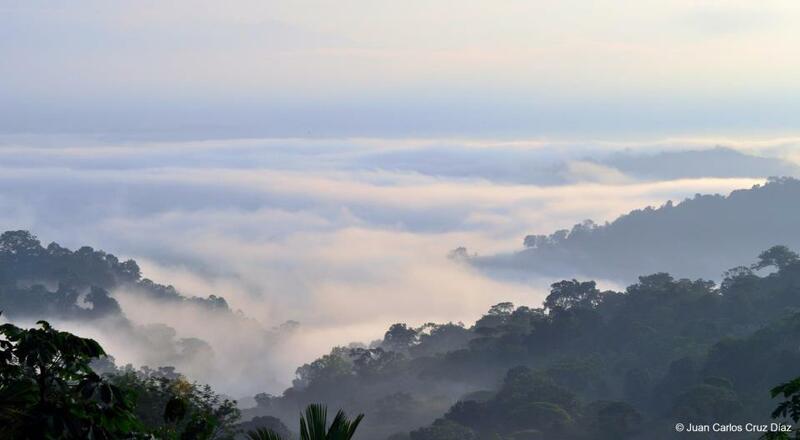 I have been in other countries before with rainforests, but Costa Rica´s Osa Peninsula tops the list as the best one. I definently will have plenty of stories to tell my friends, I´m very glad and grateful that I had the opportunity to set foot in this foreign land. Maps can only take you so far; there are no turtles, stars and monkeys on a map. It is only when you set foot in a new location, will you actually feel and experience an entirely new world. Mammals are a very important element in ecosystems, and the rainforest is no exception. Wildcats as the top predators in an ecosystem provide control for the lower levels of the food web such as herbivorous animals, which in turn control biomass production. Everything is in perfect balance, so if a top predator is missing from the ecosystem, herbivores will increase in number and that will tremendously affect the biomass production, potentially leading to ecosystem collapse. For this reason it is highly important for us to monitor the populations of wildcats but also their prey in order to have a better understanding of the status of these species and to be able to take actions for their conservation. This past August we completed our first year of interrupted camera trap monitoring for mammals and other species in the Osa National Wildlife Refuge, located in the buffer zone of Corcovado National Park, one of the most important places for conservation in the world. After one year of monitoring, we’ve gathered information on 17 species, including 4 species of felids (large cats), 11 terrestrial mammals and 2 terrestrial birds. These species are all spread among 5 different feeding guilds – groups that share sources of food. Mammal species detected during the monitoring program from 2012 and 2013. 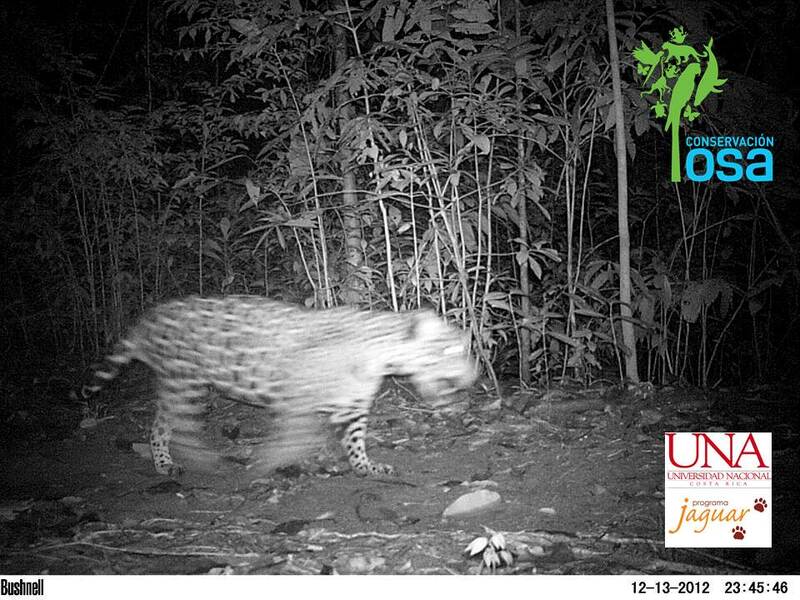 Among the wildcats, our cameras caught four out of the five species that are distributed throughout the peninsula – the puma, the jaguar, the ocelot, the margay, and the jaguarundi. 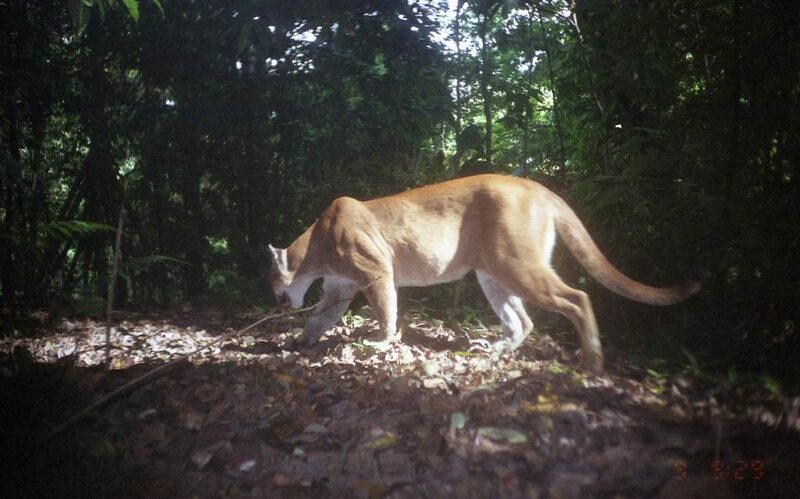 The puma was by far the most common and abundant of all the large cats we captured! The ocelot came in second followed by the margay, with jaguars pulling up the rear with just 3 captures during the whole year! Relative Abundance of the four species of wild cats detected in our monitoring program. 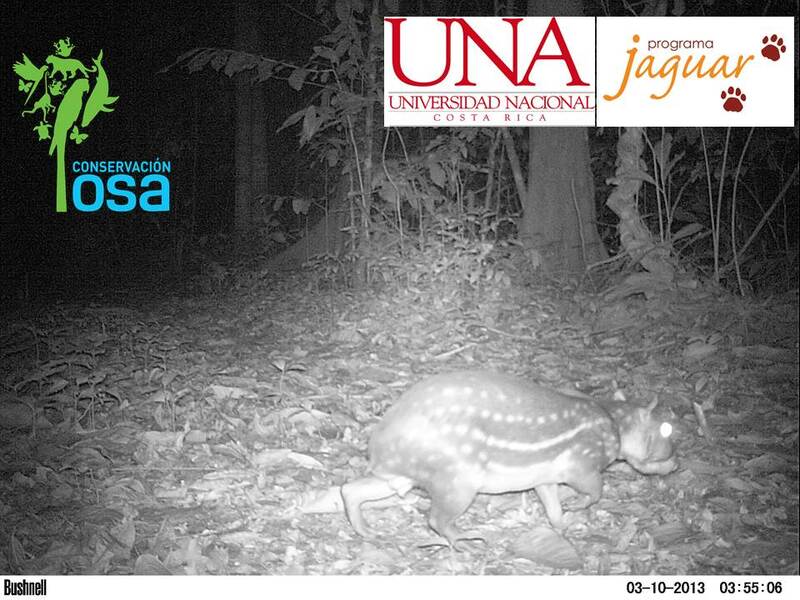 Of all species captured on camera, the most abundant were the paca (Cuniculus paca), collared peccary (Pecari tajacu), crab-eating raccoon (Procyon cancrivorus), coati (Nasua narica), the puma (Puma concolor) and the ocelot (Leopardus pardalis). We have a special interest in feline species, so this graph shows the behavior of the four different species we detected in the data. Here we can see that felines were more active and abundant at the beginning of the rainy season – although by taking a closer look you can see that the most dramatic changes occurs in the puma, whose numbers are incredibly high at the beginning of the rainy season. Although there was an increase in observation for the other species during the rainy season, they are not as active as that of the puma. Photographic capture of a Paca. 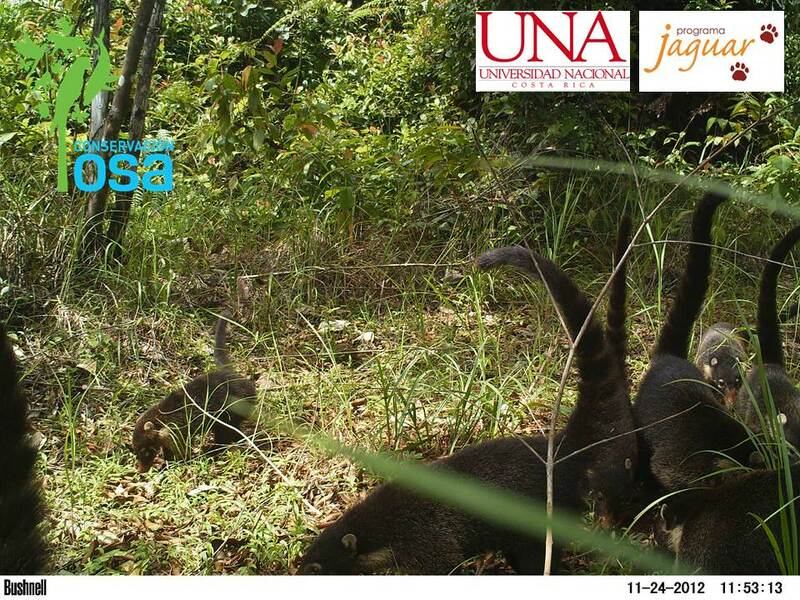 Photographic capture of a group of coatis. 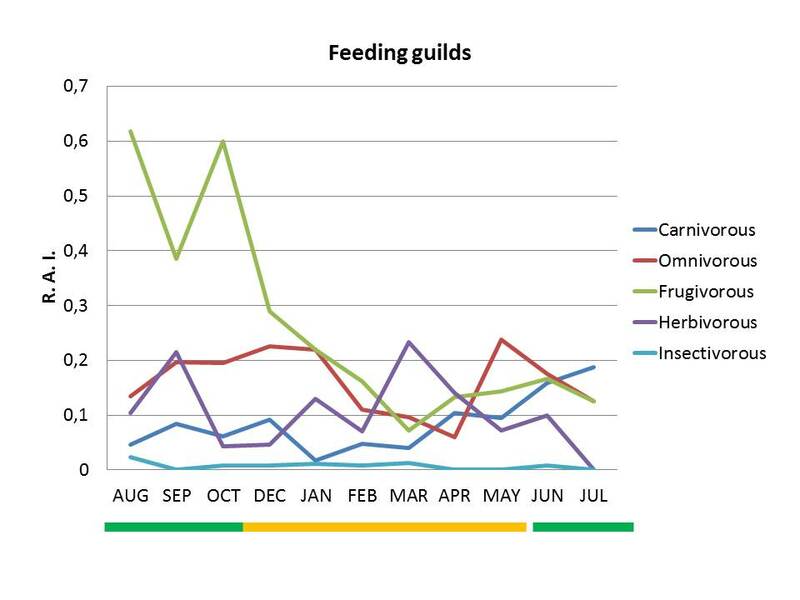 In terms of behavior, we know now that the most abundant guilds are the frugivorous species – fruit-eaters – who are most abundant during the rainy season (May – November), which coincides with the peak of plant fruit production. Similarly, populations of omnivores, which eat both plants and meat, also diminished during the dry months (December – April) and rose again with the presence of rain. On the other hand, herbivores – plant-eaters – were active almost equally during the rainy and dry seasons. Finally, populations of carnivores – meat-eaters – peaked at the beginning of the rainy season, to coincide with the increase in their prey – the frugivores. This abundance graph shows how the species that eat the same food types are dependent on factors such as rainfall for survival. In the case of herbivores that depend on fruiting trees for food, these species are limited to and dependent on the rainy season. Animals such as carnivores, which depend on herbivores as their food source, can thus also have their behavior influenced by the rainy season as a result. In this way we can see the behavior of these groups in a very general way. 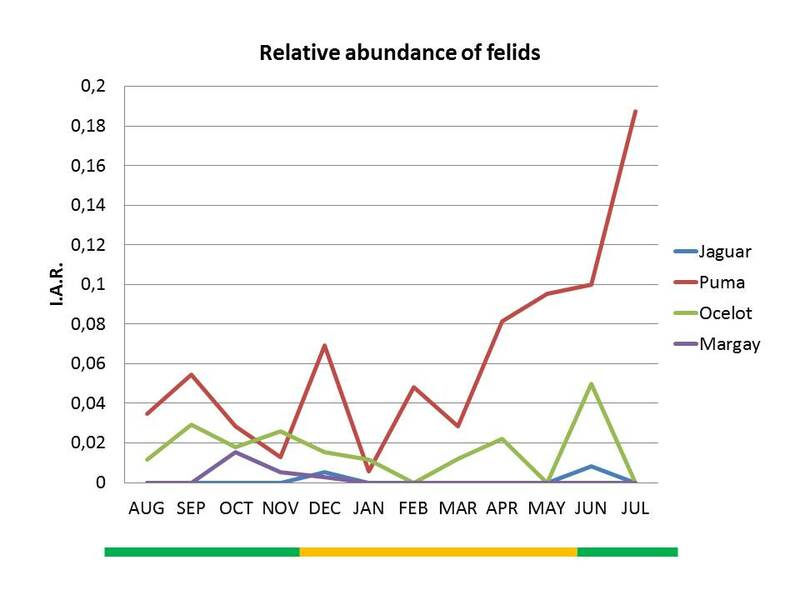 Relative abundance of feeding guilds. RAI = Relative Abundance Index. 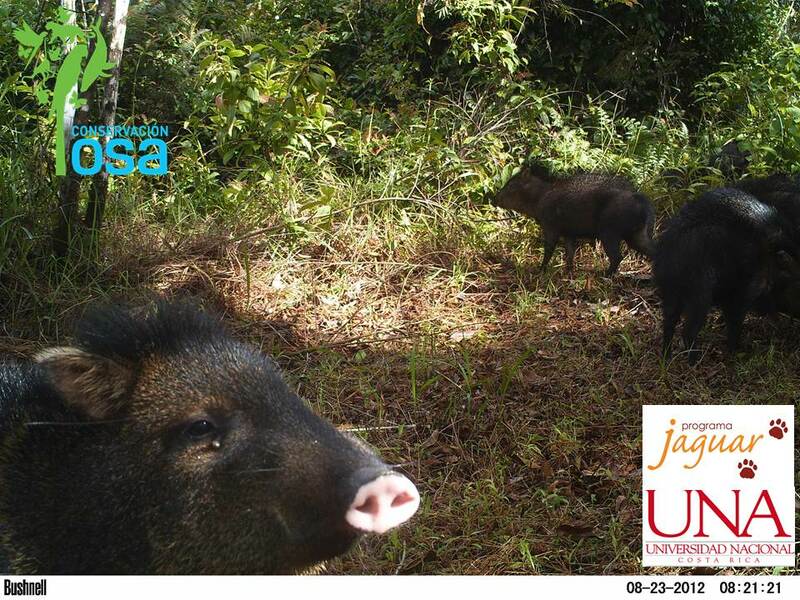 Photographic capture of a group of collared peccaries. Almost all of the species of medium and large sized mammals are normally distributed throughout the refuge, with the exception of the tapir and the red brocket deer. However, much still needs to be done to protect the habitat of wild cats, especially in places of high importance for conservation, such as Corcovado National Park and its surroundings. For this reason, we are eager to keep working and making this effort to assure a better future for these essential species, and especially for the jaguar – a cat whose conservation status in the peninsula is extremely delicate. Photographic capture of a Jaguar. This conservation effort was made possible not only by researchers but also by dedicated volunteers, donors and our followers who spread the word. 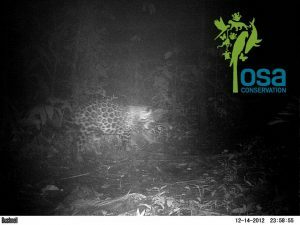 Please feel free to follow our “Monitoring program for wild cats and their prey” through our blog and web page and keep yourself informed about how can you help or contribute to the conservation of wildcats in the Osa Peninsula. Photographic capture of a Puma. Environmental education is a crucial element for promoting and teaching the importance of conservation to communities and individuals. By having a solid environmental education and outreach program, we can promote long term appreciation, awareness and respect for our environment. 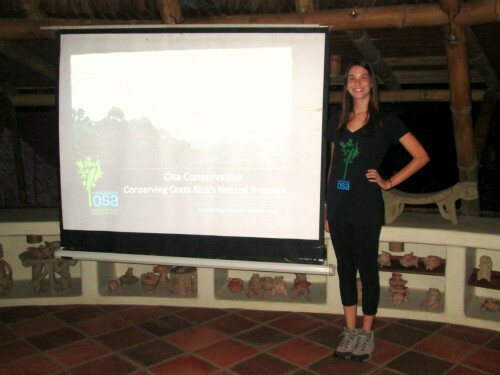 For this reason, a few months ago, as part of the Science Program at Osa Conservation, we started delivering a series of talks to locals, schools and tourists in The Osa National Wildlife Refuge and its surroundings. 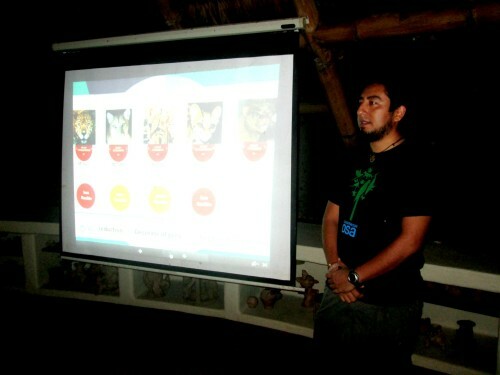 Several partner ecolodges have hosted these talks, including El Ramanso, Bosque del Cabo, and Lapa Ríos. Bosque del Cabo, El Remanso and Osa Conservation properties form the Osa National Wildlife Refuge, an area that covers around 2,500 hectares (6,178 acres) of mature and secondary forest in the peninsula. The presentations range from giving an overview of the biological characteristics of the Osa Peninsula, (richness of habitat, species and mosaic of landscapes) to the abundance and distribution of the species of terrestrial mammals from our current surveys in the ONWR. Our monitoring program is based on photographs from camera trap stations located in the ONWR, enabling us to determine the richness, density, distribution and behavior of local wildcats and their prey. Over 150 tourists have learned about our research and the characteristics of the Osa peninsula since we started our talks over two months ago. Our audiences really enjoy the presentations and are enthusiastic about the research we are conducting. 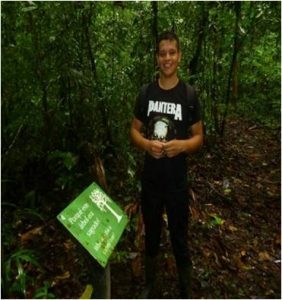 As an important part of educating tourists on how they can help, these talks give us a chance to gain feedback and spread the word about our research and Osa Conservation as an organization. 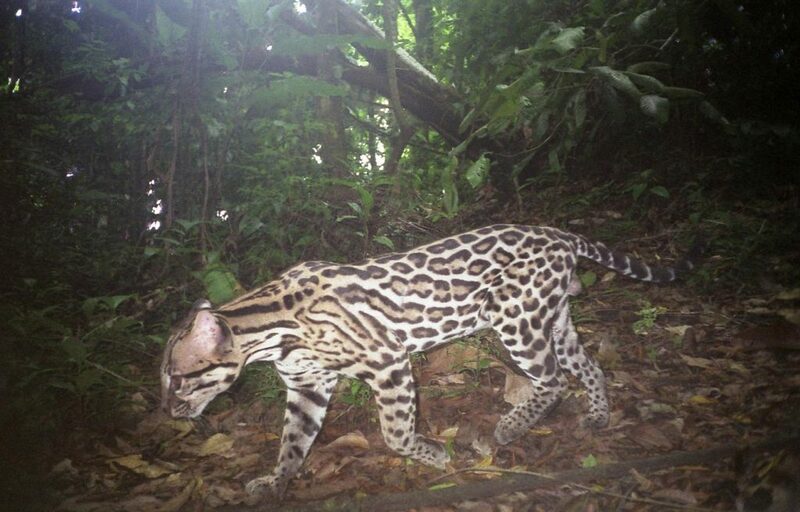 Additionally, we have started to establish a network of camera traps in the surroundings of Corcovado National Park, one of the most important places for wildcat conservation in the Peninsula. These traps are an essential for monitoring the movement of wildcats outside the park but also for determining the best candidate areas for biological corridors, which would connect the animal populations of the park to those on the outside. This initiative intends to manage the camera traps located in different properties in the buffer zone of Corcovado National Park that present high importance for conservation. By sharing this information with all the network members, we will achieve a better appreciation of the conservation status of these species in the peninsula and have a large scale view of the situation. Ecolodges like our hosts were the first ones to be included in the initiative since they have been actively involved in conservation for a long time. However, some other lodges, private owners and reserves are eager to contribute and join this monitoring program as well. By having research accompanied by environmental education and outreach, we are able to deliver a strong message on the importance of conservation to people not only from the scientific community but also the public, which promotes awareness and appreciation for our natural world. Capturing a photo of an animal in its natural habitat is difficult at best, so for the past hundred-odd years camera traps have provided a distinct advantage to ecologists – allowing researchers to capture an image with minimal disturbance to the animal and without risking bodily harm. The first camera traps, pioneered by wildlife photographer George Shiras III in the late 1890s, consisted of a large camera and a trip wire connected to a car battery. When an animal tripped the wire, the battery would ignite a small quantity of flash powder to create a burst of light just as the camera’s shutter snapped. 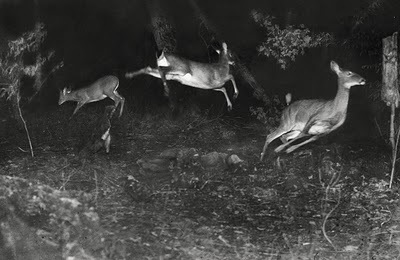 Though hardly inconspicuous to the passing animal, the method worked – giving Shiras his first remote glimpse of life in the wild – and the following image of several deer bounding away from the bright flash into the dark night. Photograph by George Shiras III, 1906. Copyright National Geographic. 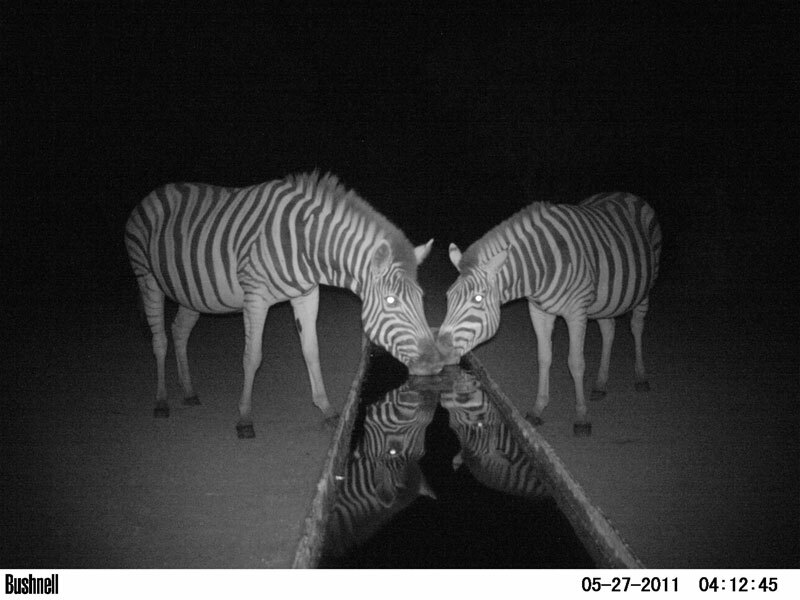 Zebras at watering hole in Namibia. Photo taken using an infrared flash. 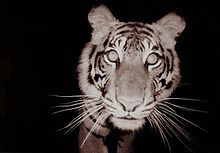 Light flashes, on the other hand, provide stunning color photos but risk scaring off or even angering an animal, such as this wild Sumatran tiger who was so annoyed by the traps laid out for him that he destroyed three in a single weekend. 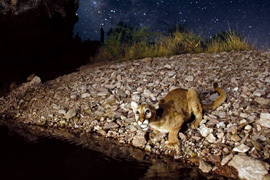 In 2006, on assignment for National Geographic, George Steinmetz became the first photographer to use digital camera traps in the wild – taking this breathtaking photo of a young mountain lion at his watering hole in Arizona’s Sonoran Desert. Photo credit: George Steinmetz. Copyright National Geographic. Camera traps have provided invaluable information on species all over the world, from number and presence of different animals to breeding status and gender ratio. They have even captured images of previously-undocumented species – such as the African golden cat and the world’s largest armadillo, seen below. 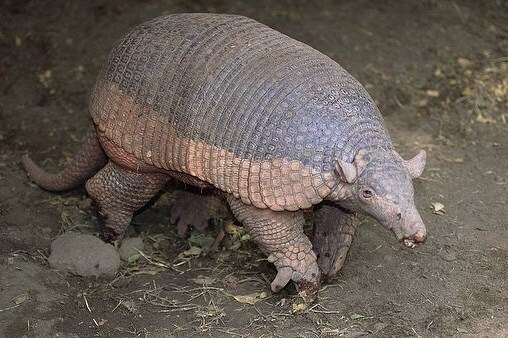 Giant armadillo (Priodontes maximus). Copyright Gabriel Rojo. www.arkive.org. One of the last places in Central America able to sustain a full range of large cats, the Osa peninsula is home to the Jaguar, Puma, Ocelot, Jaguarundi and Margay. 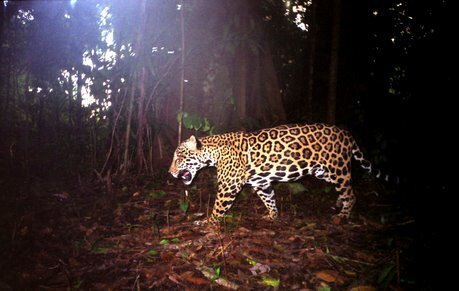 The most sensitive of large cats to habitat alteration, jaguars in particular are seen as a “health indicator species” – a marker for the health of an entire rainforest ecosystem. 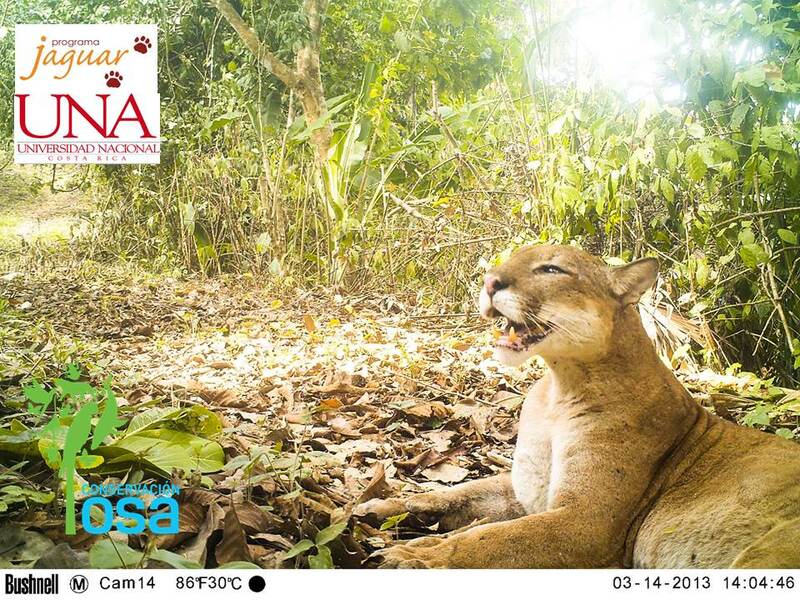 Using a vast network of camera traps, Osa Conservation monitors these majestic felines, generating data that is crucial to assessing the effectiveness of conservation efforts in the Osa peninsula. Check out some of the big cats we’ve captured around our stations! Jaguars are very charismatic creatures, and for indigenous people and ancient civilizations, were considered symbols of power, majesty and wisdom. While that symbolism still holds true, we now also recognize their intrinsic value for maintaining biodiversity in the forests. They are on the top of the food chain and therefore the health of their population affects all subsequent levels. 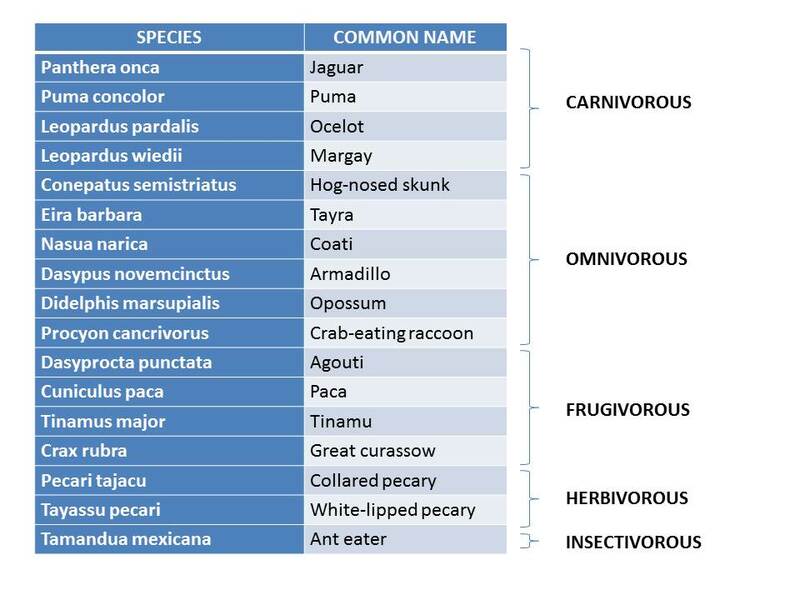 In the absence of Jaguars, breakdowns occur in the ecosystem such as increases of populations of herbivores, decreases in population of some species of plants (eaten by herbivores) and loss of other species of birds, insects and reptiles that depend on those plants.